Spätzle (also Spätzli in Northern Germany; Nockerln and Knöpfle in parts of Southern Germany and Austria; and Knöpfli in Switzerland), are a type of egg noodles and small dumplings found in the cuisine of Germany and regions of neighboring Austria, Switzerland, Hungary, Slovakia, and France (Alsace). Spätzle dough typically consists of few ingredients, principally eggs, flour, and salt. Often, water is added to produce a thinner dough. One traditional method of determining the correct proportions of ingredients is to use as many eggs as there will be people served, plus one egg. To the eggs an equal volume of water or milk is added. Then gradually enough flour is added to reach the desired consistency. In addition to salt, spices such as nutmeg, dill, or caraway may be used, depending on what foods the spätzle will accompany. For certain specialty dishes, the dough may be enriched with minced pork liver (resulting in Leberspätzle), spinach, or finely grated cheese. The desired consistency varies from a soft, sticky dough to a thick batter. The consistency, and the method used to form the noodles, affects the resulting shape of the noodles. 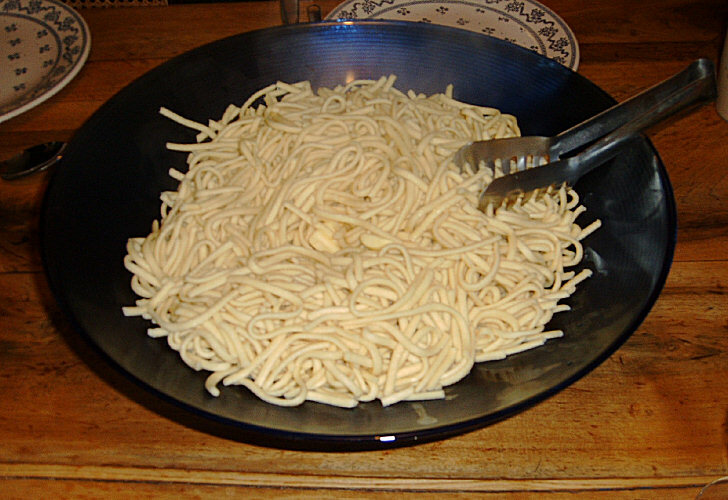 Common variants are small button or lump noodles (Knöpfle), large thick noodles, and long thin noodles. All are more or less irregular. 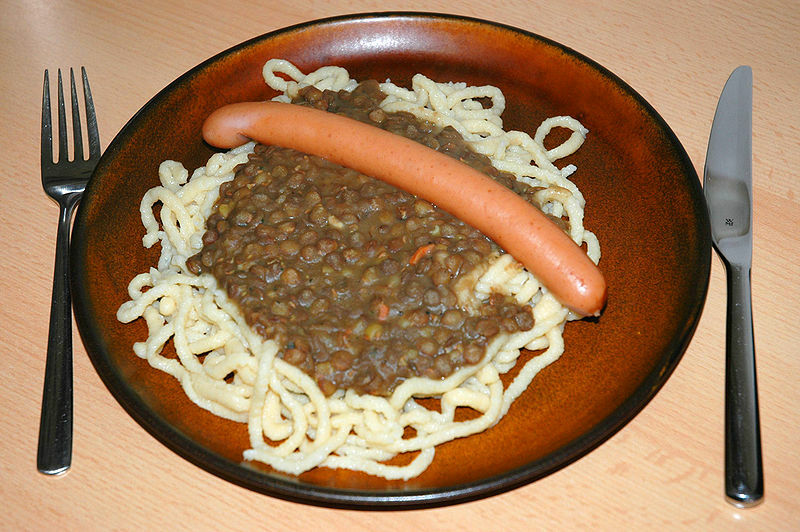 Left: Home made knöpfle type spätzle. Handmade Spätzle is formed by grating a lump of dough, scraping strips of dough from a cutting board or the rim of a bowl, by pushing the dough through a mechanical device. Several types of spätzle maker devices are available, that resemble a strainer, (or colander), a potato ricer, a food mill or coarse grater. Home made spätzle are formed directly over a large pot of boiling water (usually) or broth, into which they drop. After boiling gently for about three minutes, the spätzle rise to the surface; they are drained and served immediately. Commercially made noodles marketed as spätzle may bear little resemblance to handmade spätzle, being more or less regular in shape, and dried. They are cooked in the same manner as any dried egg noodle. Spätzle typically accompany meat dishes prepared with an abundant sauce or gravy, such as sauerbraten and rouladen. 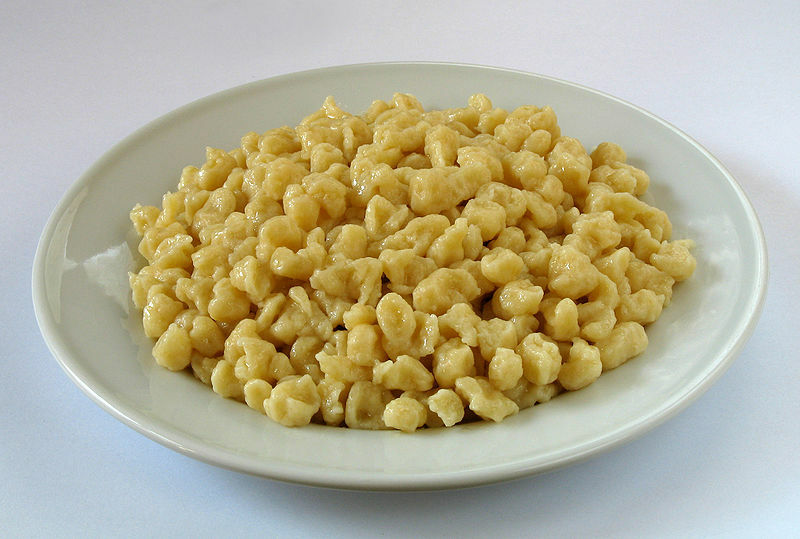 In Hungary spätzle often are used in soup. Left: Home made thin spätzle with lentils and sausage.